Aro-takaro are the 'face' of traditional Maori games. They are the iconic implements associated with indigenous games practices, rituals and protocols. A testament to their prolific ancient uses are the numerous games artefacts, vividly etched in millennia-old cave paintings, all... read full description below. Aro-takaro are the 'face' of traditional Maori games. They are the iconic implements associated with indigenous games practices, rituals and protocols. 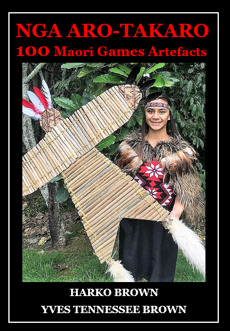 A testament to their prolific ancient uses are the numerous games artefacts, vividly etched in millennia-old cave paintings, all over Aotearoa/NZ. Aro-takaro were spiritually conceived from the environment by villagers and perfected as social and educational tools by tohunga, the intellectual giants of the day, known as Hohou-Rongo - revered games artisans and peace-makers. The Hohou-Rongo utilised aro-takaro as mechanisms for peace, enjoyment, social bonding and in education to make their tribespeople resilient and adaptive. Each of the 100 aro-takaro within this volume is illustrated, has a description of the materials it is made from and activities that it is synonymous with. The reader will immediately be able to visit their sacred forests, and with due reverence, identify resources with which to make aro-takaro. These artefacts are as diverse as parahirahi (games sandals) & pikipotae (peace headdresses), equipment for hakura & matamatarongo protocols ( peace dances) and ki (balls), pona (knots) and perepere (games pieces). Here then is a cultural resource which can link educationalists with some of the aro-takaro technologies, conservation practices and beliefs of our forebears. Yves Tennessee Brown is a Year 13 student at Kerikeri High School with a passion for nga taonga takaro. She has performed kapa haka and facilitated Maori games in NZ, Holland, Italy and France and as a fourteen year old participated in the First World Indigenous Games in Palmas, Brazil, 2015. Harko Brown lives in the Bay of Islands with his wife, also a teacher, and three of their six children. He is the author of the seminal 'Nga Taonga Takaro' series and a contributor to several journals, encyclopedias and papers on Maori games histories. This is his second collaboration with his daughter Yves, their first book 'Te Mara Hupara', was published in 2017.